Many people at some point in their life will experience an elbow injury. There are countless forms of elbow injuries with varying degrees of severity, but it’s important to know the most common types of elbow injuries and their associated symptoms. The two most common forms of injuries affecting the elbow are elbow bursitis (elbow bruise) and tennis elbow. The most common type of elbow injury is Elbow bursitis. Elbow bursitis is basically the inflammation of the bursa sac. Bursa sacs are fluid filled sacs which provide additional cushioning so as to prevent the ends of our joints from excessive wear. These fluid filled sacs are generally located around every joint in the human body. These particular bursa sacs are referred to as the Olecranon Bursas and they're located on the back of the elbow. Elbow bursitis typically occurs when the elbow is subjected to some form of blunt force trauma, such as a fall where the tip of the elbow comes into direct contact with a hard surface. Generally, if you’re suffering from elbow bursitis your elbow will be swollen and tender. However, if your elbow appears red and is warm to the touch, your elbow bursitis may be due to an infection. If your doctor suspects that your elbow may be infected, he or she may opt to remove the fluid from the swollen area and prescribe an antibiotic. If the bursitis is not from an infection it may be treated in a variety of ways. The most common treatments for elbow bursitis typically include cold therapy, rest and anti-inflammatory drugs such as Ibuprofen. Tennis elbow is a common overuse injury that’s typically caused by a repeated twisting motion of the wrist and forearm. This condition is generally associated with playing tennis, hence the name tennis elbow, but it can be caused by any activity that involves the twisting of the arm such as when you use a screwdriver. If you’re experiencing any number of the symptoms listed above then you may have tennis elbow, but don’t worry, because there are a variety of ways to treat this condition. Tennis elbow treatments typically include heat therapy, anti-inflammatory medications and/or the use of an elbow brace or other immobilizing device. 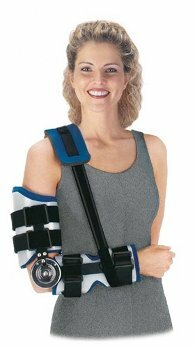 In order to prevent the injury from occurring again, an elbow strap may be worn during certain activities that aggravate the condition. About MMAR Medical Group: MMAR Medical Group Inc. is a supplier of medical products including a wide selection of diabetic shoes, as well as orthopedic braces and supports. For top-of-the-line medical knee braces, a wide elbow brace selection and other quality braces, please visit MMAR Medical online.